GTarcade's popular action RPG Legacy of Discord – Furious Wings is has been preparing some great deals for all players for Thanksgiving and Black Friday! After just receiving a huge update with tons of new content, LoD will be holding spectacular in-game events to celebrate turkey day! Check out the huge amount of rewards and savings! 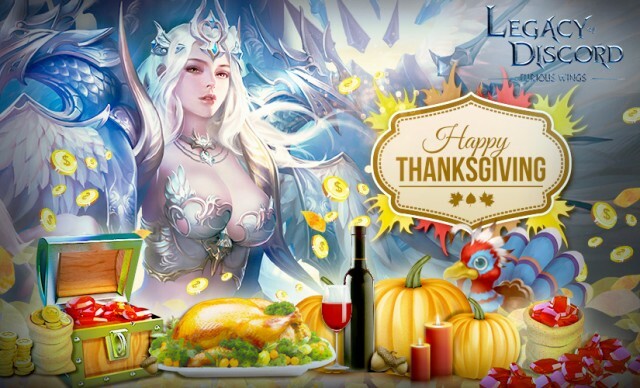 Simply login to Legacy of Discord on Thanksgiving Day to claim valuable Gift Packs! Starting on Black Friday (25th Server Time) and continuing for 4 days, login every day to receive lots of resources, including Diamonds! Starting on Black Friday (25th Server Time), players can purchase Fragments for Panthora, Immoral, and Cinder, as well as other other game resources, at huge discounts in the Black Friday Group Deal event. The more players that purchase, the greater the discount! Starting on Black Friday and continuing for 4 days, each server will have 3 different Super Value Giftpacks at substantial discounts. These Giftpacks have limited quantities, and all players on a server can rush to purchase; first come, first serve. Giftpacks will refresh at 12:00PM and 6:00PM each day at server time. 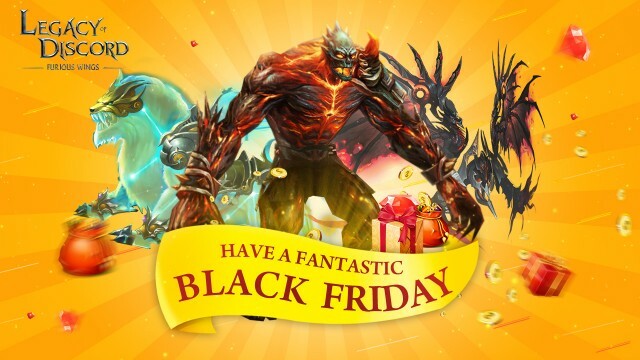 Starting on Black Friday and continuing for 4 days, not only can players purchase many items and resources at huge discounts, spending specific amounts of Diamonds will earn additional special rewards. As part of the Black Friday events, the rewards will be greater than normal. Play Legacy of Discord now and experience all-new content including the new open PvP area, the Untamed Wilds! Don’t miss the best free to play action RPG on mobile!